State House, Freetown, Wednesday 30 January 2019 – His Excellency President Julius Maada Bio has officially launched the Global Partnership for Education, GPE, programme and commissioned fourteen Teaching Service Commission district offices at the St. Anthony Boys Primary School, Brookfields, Freetown. In his welcome address, Minister of Basic and Senior Secondary Education, Alpha Osman Timbo, said the GPE was geared towards building a stronger foundation for learning in the country with a common mission of mobilising global and common efforts to constitute the achievement of quality education and learning for all through inclusive partnership. He said his ministry was working with development partners to enhance the successful implementation of the free quality education. He added that they would also ensure complete assess for pupils, adding that the ministry had already completed a comprehensive survey of all schools in the country using digital technology. He disclosed that such information was vital for government’s planning for future interventions. Global CEO for GPE Secretariat, Alice Albright, said she was powerfully impressed by President Bio’s commitment to improving access to education in the country and commended the government for introducing the free quality education programme. She added that the President was putting words into actions that would be important to change the lives of Sierra Leoneans. She also stated that investing in education was vital in transforming lives, building communities and growing economies, especially when it was centred on educating girls. She further noted that investing in girls to learn in a safe place was beneficial for a lot of reasons, not only for the girls but also for their families and communities. She said it also meant that young girls could imagine living better lives. Chairperson of the Teaching Service Commission, Dr Staneala Beckley, said with support from the GPE, efficiently managed by the Ministry of Education, they had made it possible to construct fourteen district offices across the country and a headquarter in Freetown. She said with a similar support they had completed a baseline study, teachers’ policies and a comprehensive assessment of the situation of teachers across the country. In his keynote address, President Julius Maada Bio said the work of the GPE aligned very closely with and promoted the core principles of his government’s flagship free quality school education programme. “I have identified ACCESS, QUALITY and RESOURCES, RETENTION, COMPLETION and POST-COMPLETION. This GPE grant cycle addresses ACCESS, ensuring that every Sierra Leonean child has access to equal and free quality education regardless of socio-economic, gender, and disability, and QUALITY, providing adequate teacher training,” he said, adding that both staples had a direct impact for retention, completion and post-retention. He said, in addition, that the GPE project would also move Sierra Leone toward achieving the Sustainable Development Goal 4 (SDG4), which required all nations to “ensure inclusive and equitable quality education and promote lifelong learning opportunities for all”. The President added that: “Of importance is also Target 4.2 which requires that by 2030, nations must ‘ensure that all girls and boys have access to quality early childhood development, care and pre-primary education so that they are ready for primary education.’ So, although early childhood education is not mandated in our constitution, my government deems the provision of free quality pre-primary education crucial for the development of early cognitive skills, retention, persistence in school, improved learning outcomes, and completion. It provides a solid foundation for success”. 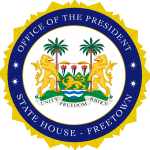 The President disclosed that, as it were, only 11.5 percent of 3-5 year-olds had access to pre-primary education in Sierra Leone, adding that among 6-11 year-olds, Early Grade Reading Assessments and Early Grade Mathematics Assessments (EGRA and EGMA) achievement reports were depressingly low. He emphasised that the logical connection was obvious that there was a direct correlation between early childhood learning and academic success in later years. “This brings me to another crucial element to improving learning outcomes in our schools. Earlier this month, I launched the teaching and learning materials and made a strong case for improving the quality of teaching in our schools. High-achieving students are motivated to engage, think critically, and explore possibilities when they have good teachers. I acknowledge, at this juncture, the support of DFID (through Leh Wi Lan), UNICEF, the World Bank, the EU, Irish Aid and our other development partners who have supported teacher training and development. “My government through the Ministry of Basic and Senior Secondary Education (MBSSE) is providing partner funding with the GPE for establishing a Learning Assessment Unit. This will ultimately improve teaching effectiveness. Additionally, the Education Act of 2004 and the Teaching Service Commission Act of 2011 especially provide for devolution of decision-making on training and assessing teaching. My government believes that local planning, local responsibility, and local accountability for achieving local targets is best for educational outcomes,” he said. President Bio acknowledged recent positive administrative changes within the Ministry of Basic and Secondary School Education in ceding more responsibility to the District Education officers and involving Ward Education committees in planning and decision-making. He stated that a decentralised school monitoring, data collection and management system was ultimately good for providing the best data on which the government could predicate policy and planning. “The District Education Office can provide overall lead especially using national benchmarks. We must allow the Teaching Service Commission to fulfil its constitutional mandate of training, assessing, and certifying teachers at all devolved levels. It is with great pleasure, therefore, that I also commission, today, 13 newly-constructed Teaching Service Commission (TSC) District Offices, and one refurbished using funding from an earlier GPE grant cycle,” he concluded.